The first railway in Cheshire was the Liverpool & Manchester, which opened in 1830. At that time the county was very rural, but as the railway ran along its northern border it quickly attracted other railway companies wishing to build lines linking it to potentially profitable routes into north Wales and the Wirral. From this time on Cheshire developed one of the highest concentrations of railways anywhere in the country. After the high point of the Victorian era however, the first half of the twentieth century saw the beginning of a decline and today, the once extensive web of branch lines has all but disappeared. Many have long been forgotten but this entertaining and detailed history tells their story. 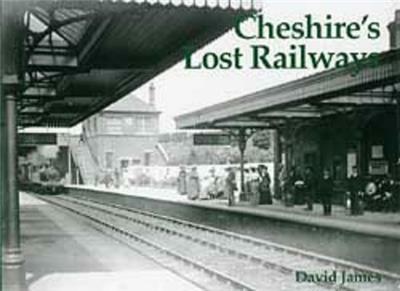 It includes forty-eight period photographs, mostly of lost stations but with a very few that are still in use. This book shows them all in their steam heyday. The locations featured are Heswall, Bollington, Capenhurst, Chester Northgate, Dunham Massey, Neston & Parkgate, Whitegate, Winsford & Over, Northenden, Stockport Tiviot Dale, Higher Poynton, High Lane, Middlewood, Marple Rose Hill, Over & Wharton, Bank Quay, Arpley, Latchford, Lymm, Heatley & Warburton, Broadheath, Waverton, Malpas, Wheelock & Sandbach, Worleston, Beeston Castle & Tarporley, Saltney, Minshull Vernon, and Hartford & Greenbank.